Mother and fawns take a break while staying out of the road, for now. Now that school is back in session, we’re supposed to be extra careful in watching out for little children in traffic. While we’re doing that, we might also want to watch out for wildlife, especially deer, meandering along our country roads. In our neighborhood, we’ve had a doe and her two fawns hanging around. This, I think, is the second or third generation of deer making our neighborhood its home. Now and then they appear at the feeder and get a drink from the bird bath. The other day the fawns took an afternoon nap in the yard, enjoying the shade of a tree. But most of the time they roam, looking for something tasty to nibble. This was a problem for the fawns when they were still too small and awkard to follow their mother as she leaped across the roadside fences. So they would run up and down the street looking for a gap. Now they’re old enough to clear the wire, and only the smaller of two — the one that still has more spots — sometimes gets hung up and has to struggle to get across. One sunny morning a couple of years ago, I heard a gunshot. When I looked out the front door, a deputy sheriff was just reholstering his weapon. He had been called — not by me because I wasn’t aware of what had happened — to dispatch a deer. The animal had been hit by a passing car and was lying in the ditch, injured but still breathing and unable to move. 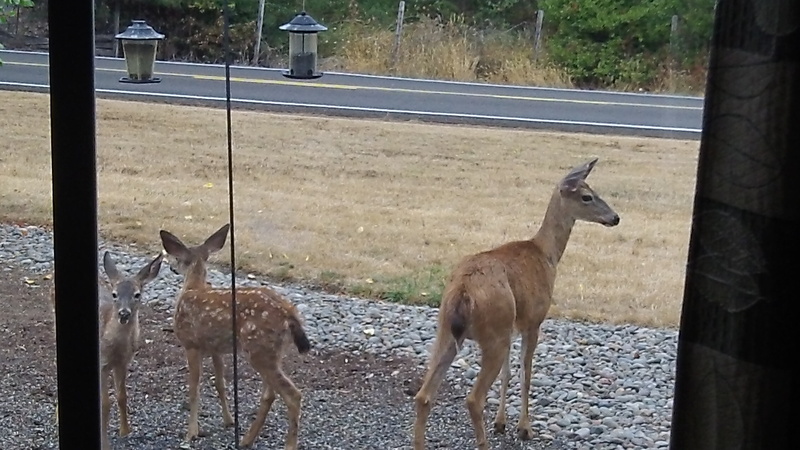 All over the country, the numbers of deer and other kinds of wildlife have grown over the last few years. One reason is that cities and suburbs have continued spreading into former farm country and even uncultivated lands, offering wild animals more convenient places to feed (like my bird feeder). 1.) At night, car headlights often cause deer to “freeze” confusing them so they don’t know which way to go. Give them space and time to get out of the way. 2.) Deer hooves are very hard and on pavement, have little traction. Again…give them the space and time to move off the road. A deer can cause considerable damage to your car as well, and there have been cases where a big deer, caught just right, can actually come through your windshield. This has caused death to the car occupants. Be on the lookout for the reflection in their eyes and don’t assume which way or when they will move. They can be unpredictable.